I’m sitting in the airport in Seoul Korea, on my way home from a wonderful week in Chiang Mai Thailand. 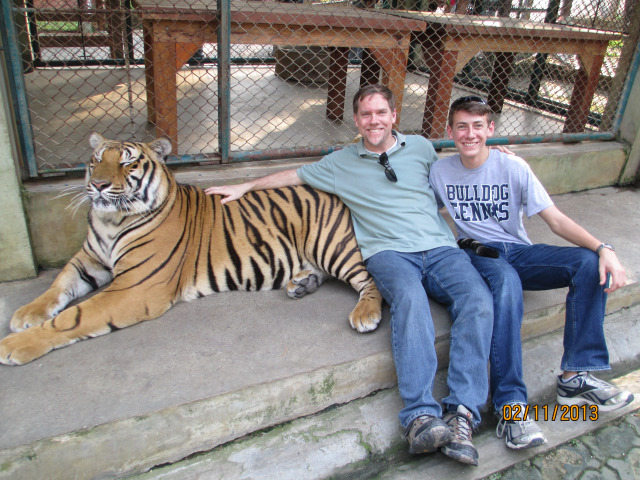 My son, Joel, was able to join me for the trip which made it extra special. We were ministering at a conference with Reach Global, the missions arm of our denomination. There were about 80 missionaries there from the Asia region. We met lots of wonderful people, including a woman who had actually babysat me when I was 3 years old in Ardmore Oklahoma! We hadn’t seen each other in 47 years….and there we were in Chiang Mai at the same conference. I had the opportunity to speak a couple of times to the group, sharing from Philippians 3 the joy of living the gospel. Very fun. Joel helped with the tech side of things during the worship gatherings. Then Joel and I both had the privilege of being on listening prayer teams. These teams of 5 people prayed for individual missionaries who had signed up for a 20 minute session of listening prayer. What’s fascinating about these prayer times is that the listening prayer team usually has no knowledge of the people receiving prayer. When they come in for their session, we simply quiet our hearts and ask the Holy Spirit to speak. Often the Spirit gives pictures or Scriptures for the person. It’s amazing to see how God speaks. Our team prayed for a gentleman we didn’t know anything about. One team member saw in her mind a picture of a sailboat and began to describe what she believed the meaning of this was. At the end of the prayer time, we asked him if any of the stuff we prayed was resonating. He about jumped out of his chair and said, “I own a sailboat and often go out sailing.” It was a cool reminder to him that the God of the universe knows him so personally. 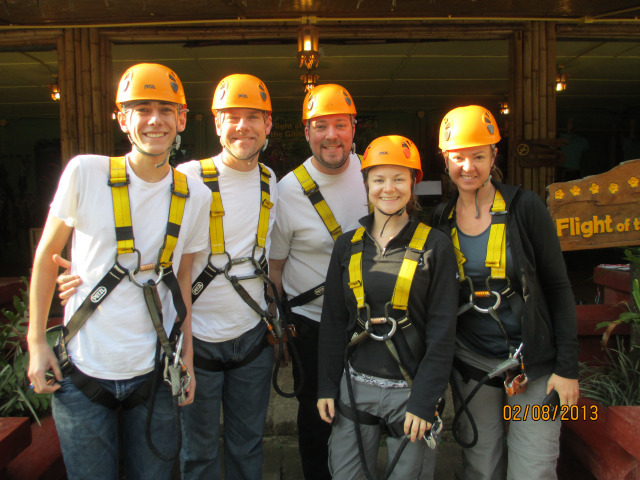 Here’s a video of me doing one of the zip lines, which was 800 meters long. Quite the rush. If you’ve ever been to Thailand, you know that one of the main vehicles of transportation are the scooters/motor bikes. One day, our team rented scooters. Love my Batman scooter? That day we did a 3 hour trek up and around a mountain just outside of town. We came back into Chiang Mai at rush hour and had to weave in and out of heavy traffic. At one point I looked down and discovered I was going 80 km/hr. 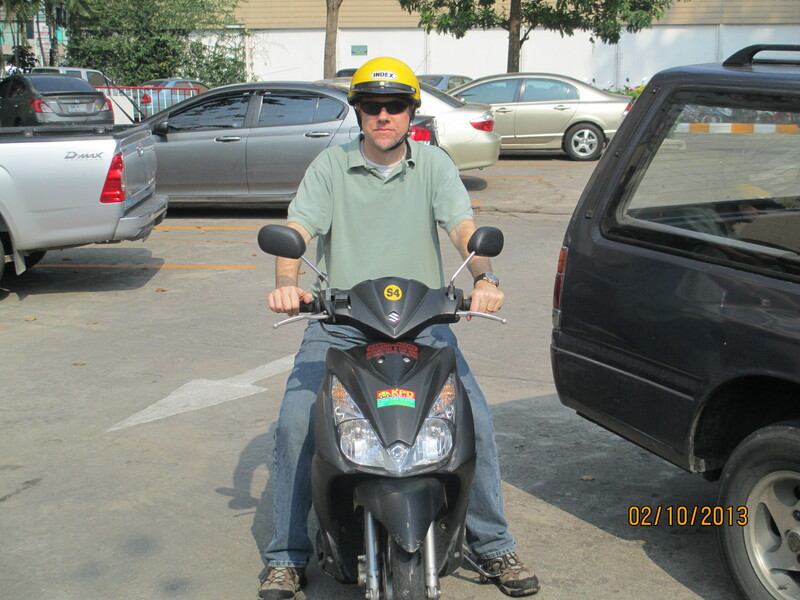 Having never done a motorcycle or scooter before, it was quite the experience. Here’s Joel and I sitting next to a very real and very large tiger. The only downer on the trip was Joel and then me getting a stomach virus. Mine hit really hard hours ago as I was in the Chiang Mai airport. My last memory of Thailand is me in a bathroom stall, trying unsuccessfully to throw up. We are both not too excited about our next flight, which is 11 hours…but we are excited to be heading home.